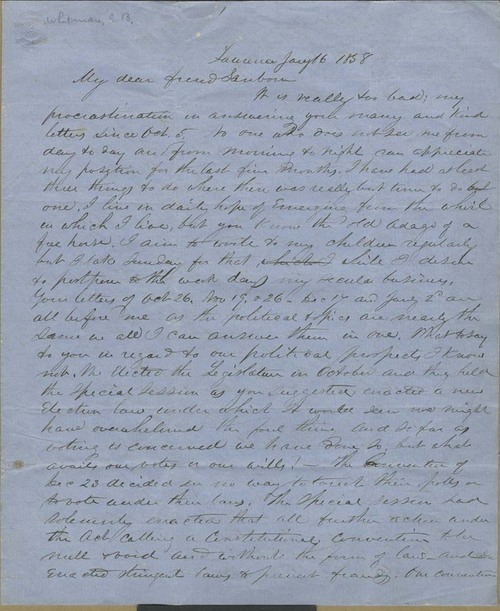 E. B. Whitman wrote Sanborn this lengthy letter from Lawrence, describing the political events that had unfolded in the territory since the October 5, 1857, election. Among many other things, he mentioned the split that took the "National democrats" out of the movement over the issue of participation in the state elections under the Lecompton Constitution, January 1857. This "Free State ticket" was, according to Whitman, "a disgrace to the cause," but it attracted a good number of votes and won "a good working majority in both houses and so our people proclaim a victory." Whitman, who had long been a faithful supporter, was seemingly losing confidence in John Brown, as were "the people."